Irma Hodge�s wealthy stepfather, Sumner Hodge, is withholding her inheritance because he dislikes her boyfriend, �folksinger� Con Bolton. When someone supposedly takes a shot at Sumner, he suggests to Lt. Anderson that Con is to blame, claiming this is the second attempt on his life. But for Sumner, three proves the unlucky charm. His car goes over a cliff with him behind the wheel, and an investigation reveals it had no brakes. Witnesses claim Con was fooling around with those brakes minutes before the smashup. The singer must call on Perry to repair the damage. Uncredited Actors: Phillip Ober also appears uncredited as Adrian Hodge, Sumner�s brother. Posted by daveb, 7/3/2009. + Incidentally, Ober was the third husband of Vivian Vance (Ethel Mertz on I Love Lucy). Submitted by gracenote, 8/19/2011. Location: A shot of Malibou Lake appears in this episode. Reported by Charles Richmond, 7/3/2009. Read more about this lake at The Lakes. + The hair pin turns that do in Sumner Hodge at the 22-minute mark are on Mulholland Highway just a couple miles away from Malibou Lake as he approached Las Virgines Road. They are pretty tricky even when you do have brake fluid. And at the 35-minute mark Perry scores again with a one-in-a-millon parking spot at 111 N. Hill right in front of the Stanley Mosk Courthouse. Submitted by Eric Cooper, 9 August 2011. ++ Dramatic footage through the windshield of the car as it plummets over the precipice. jfh 19Jan2017. + IMHO Della calls the Hodge residence again, apparently successful this time in convincing the maid to divulge the number to the cabin. jfh 19Jan2017. 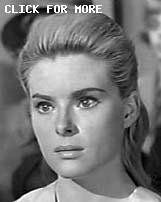 Pat Priest makes her first of two appearances on Perry here as Miss Young. This same year, Ms. Priest would replace Beverly Owen as Marilyn Munster, her most famous role, on the CBS sitcom The Munsters. Submitted by PaulDrake 33, 29 September 2009. Sightings: In the back row of the courtroom gallery, Distinguished Gentleman #1 and Little Old Lady #1 sit together. She turns to him as if to whisper during a surprising moment. Pencil Mustache Man, in the front row, appears rather detached from the situation. Quiet Old Man #1 is there, too, but blurry. More here. Submitted by gracenote, 3/22/2011. + Earlier, While young Con sings to his love at the Lone Pine Club, the aforementioned Gentleman sits at a table in the background, engrossed in conversation. Submitted by gracenote, 8/18/2011. Uncredited Actors: Guarding the house by the lake is a deputy sheriff played by Don Anderson. Interestingly, the camera lingers a long time on the deputy as he and Jack Talley (Lonny Chapman) eye each other. Anderson looks like he�s going to speak, but doesn�t. Later, Talley even barks an order at the deputy!! Submitted by gracenote, 3/22/2011. That�s right, kids! Our singing, guitar-wielding defendant (Paul Carr) also appeared once (and only once) as Lt. Lee Kelso on Star Trek, in the so-called �second pilot� (but third broadcast episode) called �Where No Man Has Gone Before.� Submitted by gracenote, 3/22/2011. More Trek Alumni can be found here. + The song our man Con sings is �The Riddle Song��an English folk song. Submitted by gracenote, 8/18/2011. ++ And at the end, Con sings "This Train," the version written by Peter Yarrow and Paul Stookey and recorded on the first "Peter, Paul, and Mary" album in May 1962.- Submitted by 10yearoldfan, 28 September 2014. +++ "This Train" was not "written by" Peter Yarrow and Paul Stookey. Their version was a "cover," a 1950s-60s term to indicate a song recorded by White people to render acceptable to White audiences a song that was actually originated by a Black performer. One of Rosetta Tharp's live versions is here. Props: At approximately 5:00, Mona Hodge grinds her heel into a smashed photograph of Sumner Hodge (Philip Ober). This same photograph (then representing Ralph Davis and in a different frame) was smashed by Mary K. Davis earlier in the series, in Episode #30 TCOT Screaming Woman. Submitted by Dan K, 1/1/16. Anomaly: Why does the judge say "Jury dismissed" at 47:12? There is no jury in the courtroom. - Submitted by 10yearoldfan, 28 September 2014. Character Names Miss Young's first name is Sally. jfh 19Jan2017. That's a very realistic face on the bust in the study, almost like a mask. jfh 25Jan2018. ++ Irma and Adrian explain Adrian's closeness to Irma and her mother predates Sumner's marriage to Mona. jfh 25Jan2018. The court hearing was held in Los Angeles. The exact location of Lake Ganado was never established, but in a phone conversation Irma said it was a 90 minute drive from L.A. Wouldn't that put the case it in another jurisdiction? >Not necessarily: remember the venue is the county, and LA County, in its 4058 sq mi, stretches far into the mountains (a wag might note that w/ traffic as bad as it is these days it might take Perry 90' just to drive from his office to the courthouse!!). Less credible, perhaps is why Andy is on the case, since he's LAPD...but we've seen before that the show has a very elastic definition of police beats. Answered by Notcom, 042817.